There was a short piece in The Guardian last week in which the author, Daniel Kalder, draws attention to works that writers themselves – and not governments, say – have tried to ‘suppress’. The examples Kalder gives in ‘When writers censor themselves‘ extend from Virgil to Mark Twain, Gerard Manley Hopkins to Gogol, Philip Larkin to Kafka. It’s a rather motley selection of writers, and the reasons listed by Kalder to justify their decisions – pride, neurosis, religion, embarrassment – no less so. Still, it was funny to learn about two works that their living authors would rather soon forget about: Amazons (1982), a novel about a female hockey player by Don DeLillo who was writing as ‘Cleo Birdwell’, and Invasion of the Space Invaders (1982), a book about arcade video games by Martin Amis. Kalder’s article reminded me of another work that has also been ‘suppressed’ by a living author, albeit one who distanced himself from the world of fiction some years ago: Kiss and Tell, by the Swiss-born writer and philosopher Alain de Botton. Published by Macmillan in 1995, there has only been one UK paperback edition, issued by Picador in 1996 (pictured left). A few years ago I wrote to de Botton to ask him about this, after discovering that there was no mention of the novel on his website. He pointed out that it was a work he was not particularly proud of, and that he preferred to direct readers to titles he was happier with. Fair enough. And although there is still no mention of the novel on de Botton’s website – nor indeed, as he pointed out at the time, of his novel The Romantic Movement – second-hand editions are widely available. 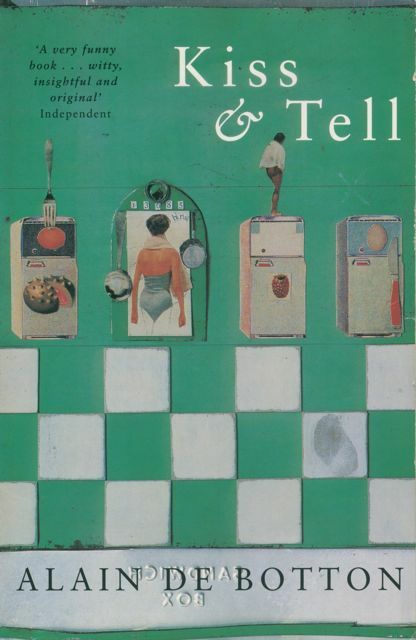 If I mention the book at all, it’s because Kiss and Tell is a novel with pictures much in the tradition of Virginia Woolf’s Orlando, a mock biography that comes complete with table of contents, preface, tables, drawings, an index and a series of photographs. Unlike Orlando, however, the subject of this pseudo-biography fails to come alive, no thanks to the narrator-biographer himself, of course. Accused by his (ex) girlfriend of being an egoist, he decides to make amends and show some empathy for the next person to step into his life. This turns out to be the 25-year-old Isabel Rogers, who soon becomes his (new) girlfriend. Starting his work with the traditional chronological beginnings, his narcissism soon gets the upper hand, however, and his portrait of Isabel is rapidly hollowed out to make way for his various reflections on the art of writing of biographies, leading to his new approaches, studying the contents of her fridge, for instance. Some of this is mildly amusing and vaguely interesting, but the problem, I found, was that the novel has been stripped of its core, and the narrator’s musings are not enough to fill the void. 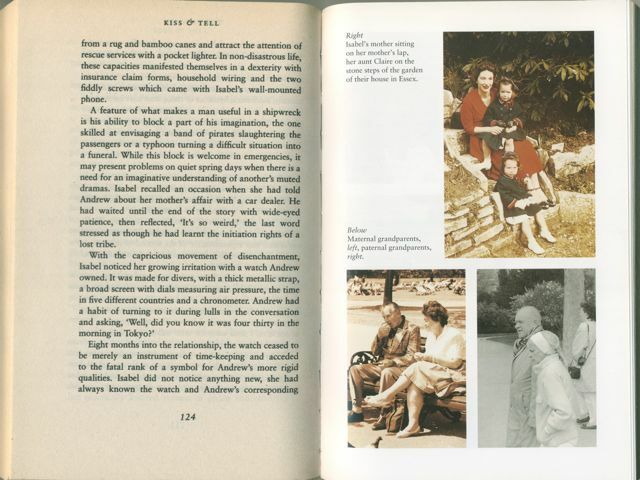 De Botton underlines this point himself, I think, by leaving out any photograph of Isabel as an adult, although he includes pictures of her family, friends, lovers and pets. 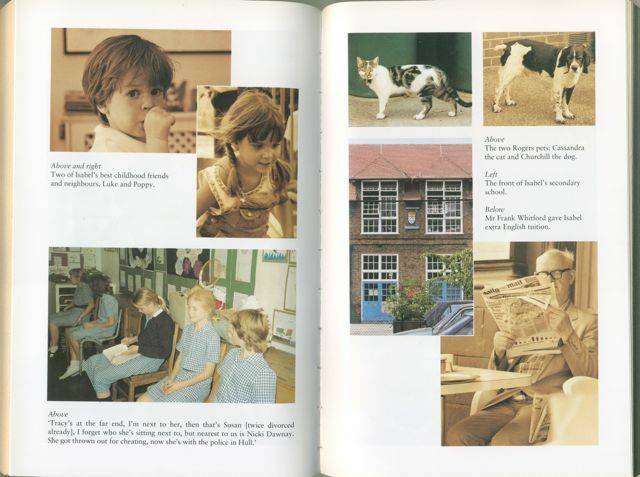 This entry was posted in Alain de Botton, Phototexts, Picture novels and tagged Alain de Botton, biography, fiction, Kiss and Tell, photography, picture novels. Bookmark the permalink.